The Yakity Yak Sea Kayaking club is a very active kayak club in Wellington. Our members enjoy paddling year round and we have a large variety of paddling environments in the Wellington Area. 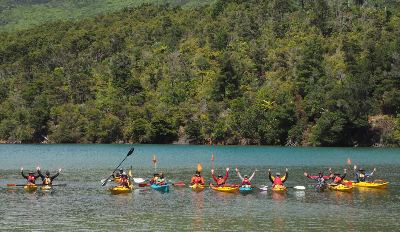 We organise trips for our members on a regular basis around the Wellington area and to other parts of NZ, including the Marlborough Sounds, Abel Tasman National Park, Nelson Lakes National Park and occasionally overseas. These are mostly camping trips but we also have trips where we stay in lodge accommodation. All club trips are led by experienced trip leaders. We regularly have local paddles on the harbour and also enjoy each others company on social occasions. A club dinner is organised at various times throughout the year and is open to non club members partners.